In the frontier stronghold of Purdey's Rest, rumors of mysterious lost ruins lead a group of young adventurers into the wilderness — and the forgotten dungeons of a legendary dark mage. Facing off against evil bandits, foul undead, and ravenous monsters, the characters seek the rewards of wealth and fame. But before they can claim either, they must survive all the deadly threats of Hazakor's lost halls. 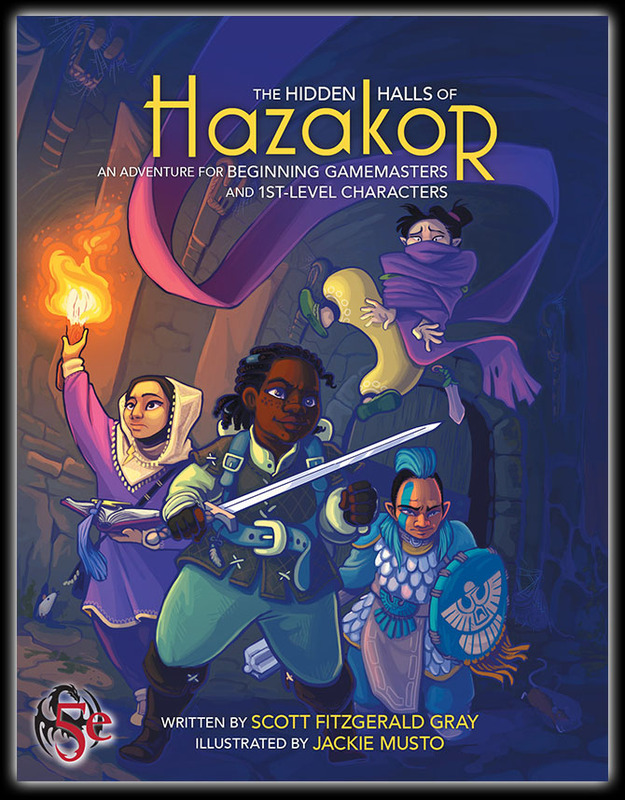 The Hidden Halls of Hazakor is a starter adventure for fifth edition fantasy roleplaying, written with a special focus on young, beginning Gamemasters of ages twelve and up. In a friendly and straightforward fashion, this adventure explores some of the ways a good fantasy RPG dungeon crawl can be put together. It offers advice on how to just let things happen during a game session, and how to not be overwhelmed by all the directions in which an adventure can go. It talks about how to bring nonplayer characters to life, how to have fun running monsters, and how to challenge the other players and their characters alike. The Hidden Halls of Hazakor is for any player ready to sit in the GM's chair for the first time — and who's ready to learn some of the tricks and techniques that help all GMs run great games. Available in PDF and softcover at DriveThruRPG. Free downloads and extras at www.insaneangel.com/hazakor. Scott Fitzgerald Gray (9th-level layabout, vindictive neutral) started gaming in high school and has worked as a writer and editor much of the time since then. After belatedly realizing he could combine both vocations in 2004, he’s been making up for lost time as a freelance RPG editor and designer, thus finally giving him the job he really wanted when he was 16.